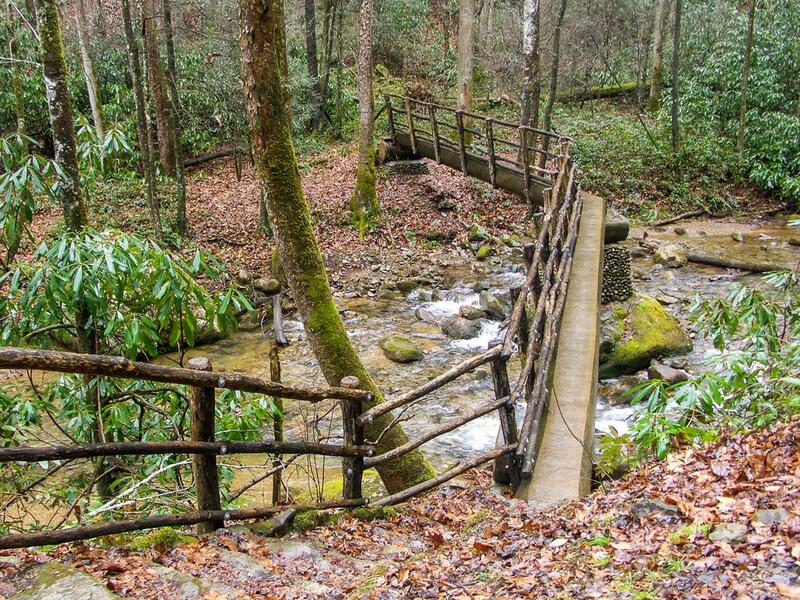 This trail is located in the Shelton Laurel Backcountry & Camp Creek Bald area. For a list of all the trails in that area, see the Shelton Laurel Backcountry & Camp Creek Bald trails list page. 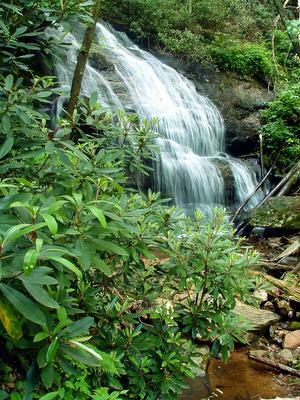 The Hickey Fork trail travels through the Shelton Laurel Backcountry Area. It should be treated as such; only those experienced in wilderness travel should attempt to hike all of it. 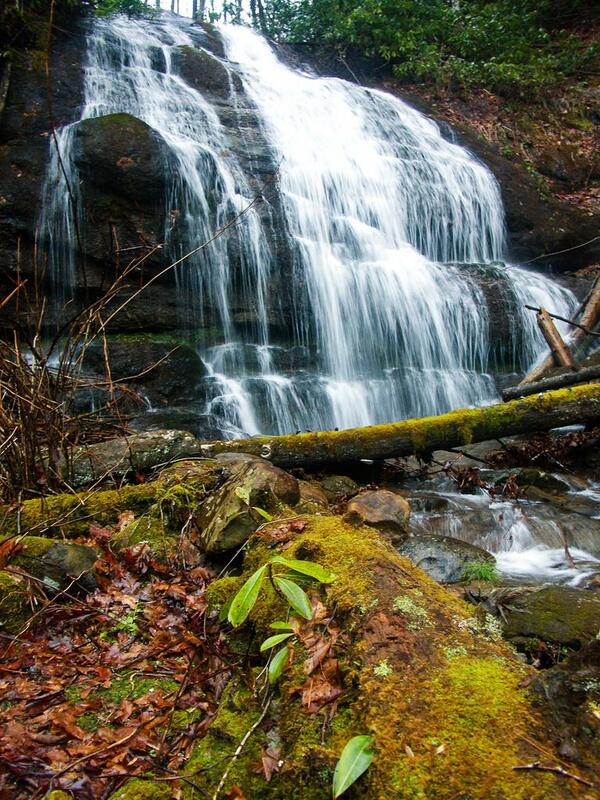 More casual hikers will enjoy an out-and-back trip to the falls on Hickey Fork without much trouble, though. The trail is well-blazed, but it is heavily overgrown - and in the summer a lot of the overgrowth is stinging nettle. Do wear long pants! 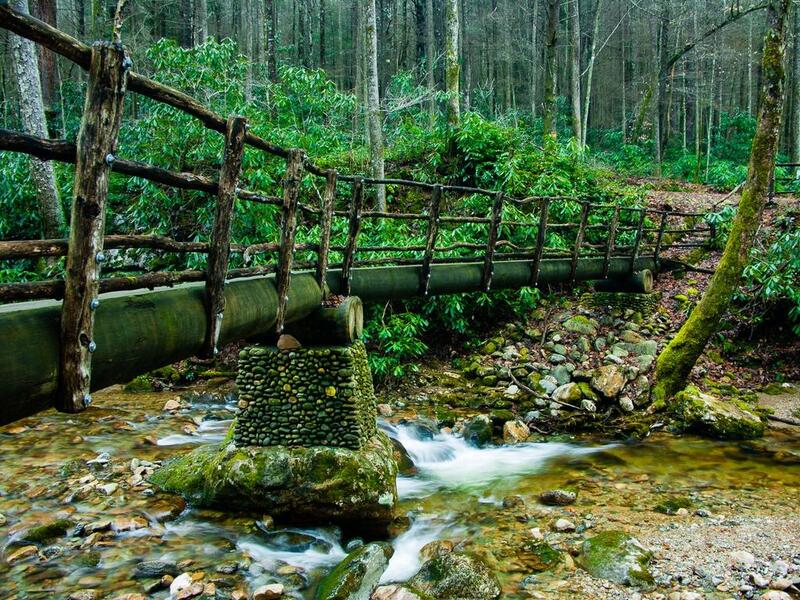 Beginning on Hickey Fork Road, the trail crosses the East Prong of Hickey Fork Creek on a sturdy log bridge. It then follows the creek upstream for a short distance before curving back and ascending the ridge on the opposite side. It's a moderate grade in a forest of dead and dying hemlocks and an understory of mostly rhododendron. The trail rounds the ridge, descends to cross a tributary on stepping stones and then moves down the tributary into the West Prong valley. 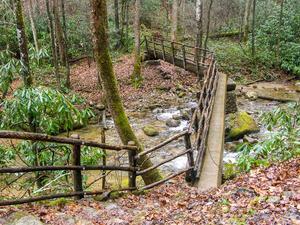 The trail veers right just above the valley floor, then comes to a crossing of the main stem of the creek. This crossing should nearly always be possible except in very high water, though you may get your feet wet. The trail then meanders through a level area, heading upstream, before beginning to climb sidehill. A couple of small tributary branches are crossed here and the level course gives way to a steady climb. At one point, a large rock juts out over the valley just to the right of the trail. The entire route is lined with rhododendron and doghobble, and most of the understory hemlocks are dead (though a few taller ones still survive as of January 2014). Just past the overhanging rock, the trail joins with and follows a tributary stream uphill for a few feet - look for log steps where it emerges on the right. Hickey Fork drops away in the valley below as you climb, before coming back to meet you again at the top of a very long waterslide and cascade below the main falls. You then pass proper waterfall - a very nice place to stop and enjoy the scenery. A steep scramble path leads to the base of the falls. This is where most people turn around, although the trail continues. Beyond the falls, the trail climbs moderately on a very steep slope beside the creek, and in a couple of places the tread is dangerously close to some small soil cliffs, formed by the creek eroding its banks up to the trail. You will cross an old landslide scar at one point. The trail will cross a tributary and then curve left, following it uphill on the right. Here the trail becomes extremely steep. The tributary fades away as you climb and you will pass into a more open woods of mostly oak and maple. Finally, the climb relents (but only slightly) as grade-reducing switchbacks were introduced near the top. The trail curves through an open cove head before switching back left and emerging on the (former?) Pounding Mill trail at Seng Gap. According to the latest USFS data, the Pounding Mill trail to the left of this intersection has been decommissioned, and the entire route to the right and up to the Appalachian Trail is now called the Hickey Fork trail. Continuing past the top of the former end of the Hickey Fork trail, this portion is used as a 4-wheeler trail, so it's double-tracked. It's moderately steep in places and rocky throughout. Travels along some dry ridge slopes, ridge tops, and finally above 4000 ft into some high-elevation coves. The trail switches back and becomes level near the top, meandering through the dense woods, which are orchard-like in places. It is heavily overgrown with grasses and blackberry vines in some spots, too. Another steep climb brings you to the intersection with the Appalachian Trail, and straight ahead through the intersection, a moderate climb brings you to the top of Camp Creek Bald, elevation 4844 ft. There is a conglomeration of radio towers and an old fire tower at the true summit. You can climb the steps of the fire tower for a better view, although the observation platform is closed.